Extensive international research shows that early engagement and support of patients after an adverse event can significantly decrease exposure to litigation and complaints. Skilled communication with patients facilitates an in-depth understanding of patients’ needs following an adverse event. This enables the organisation to more adequately support patients and meet their medical, psychological and social needs throughout the difficult recovery after an adverse outcome. 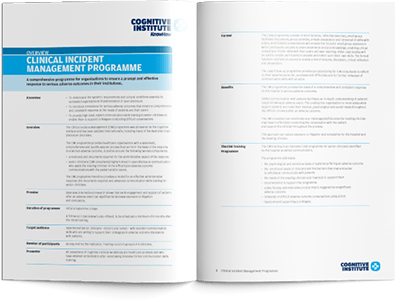 The Clinical Incident Management (CIM) programme provides healthcare organisations with a systematic, comprehensive and quality assured process that can form the basis of the response to a serious adverse outcome. training of in-house senior clinicians (CIM consultants) in open disclosure communication. They will be provided with high level, expert communication skills training to enable them to support colleagues conducting difficult conversations. The Clinical Incident Management programme has been adopted internationally, including many of the Australian Open Disclosure pilot sites. A follow-up one day review is also offered, to be scheduled a minimum of 6 months after the initial training. As required by the institution. Training occurs in groups of 4 clinicians. The two day programme consists of short lectures, reflective exercises, small group facilitated discussions, group activities, private preparation and rehearsal of skills with actors. Video case studies are used to enable participants to analyse and reflect upon their own skills. The format is carefully structured to enable a mix of lectures, discussion, critical reflection and preparation. The one day follow-up programme provides an opportunity for CIM Consultants to reflect on their experiences so far, successes and difficulties and for further rehearsal of communication skills with an actor. The Clinical Incident Management workshop is ideal for experienced senior clinicians, doctors and nurses with excellent communication skills, who are willing to support their colleagues in adverse outcome discussions with patients. 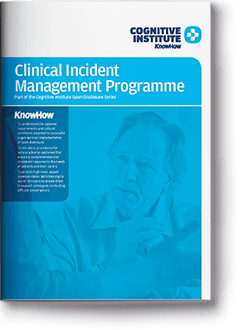 The Clinical Incident Management programme provides the basis of a comprehensive and consistent response by the hospital to serious adverse outcomes. It provides the hospital with a trained CIM consultant who can ameliorate any challenges / deficiencies the treating clinician may have in effectively conducting the conversation with the patient and support the clinician throughout the process. This approach can reduce exposure to litigation and complaints for the hospital and the treating clinician. issues around supporting a colleague. Please contact us to find out more about the costs to facilitate this programme for your team or within your organisation. Reducing risk through more effective communication with colleagues.